Dutch Illumion was started in 2002 by gitarist Eveline van Kampen, right after she finished her exams at Alkmaars guitarconservatory. At first the band played some covers from bands like Pain of Salvation and Fates Warning, before she began to brew her own music. 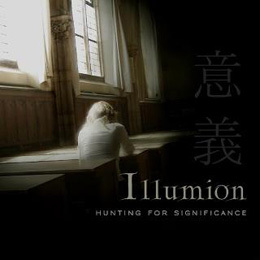 The pressrelease describe Illumion like The Gathering meets Magenta, with Ayreon influences. Myself I shall also mention ingenious White Willow as reference , here namely is served the same lovely mood and likewise music that our Norwegian friends deliver. Quite simply an awfully agreeable and relaxing album, perfect in summerwarmth. Here we only have to lean back and enjoy the music and the sun.